When an image is scaled, each individual pixel is squashed or stretched, and if scaled in only one direction, rather than proportionally, the image is distorted. 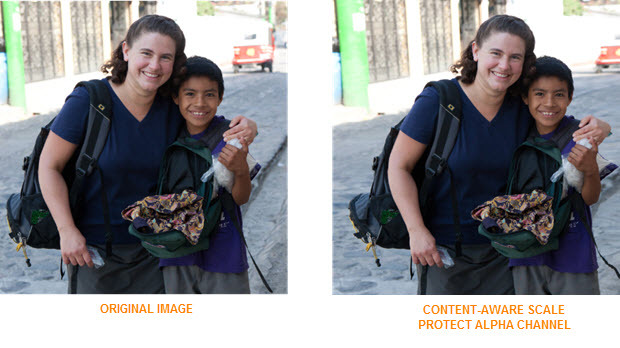 Content-aware scaling attempts to analyze the image, based on user-specified criteria, and preserve areas of detail. Content-aware scaling can be applied to RGB, CMYK, and gray-scale images. It doesn't work on layer masks, adjustment layers, 3-D layers, or Smart Objects. This feature works the same in Adobe Photoshop CS6 and CC versions. First, the layer must be unlocked. If need be, click the lock icon in the Layers Panel to unlock the layer. Go to Edit > Content-Aware Scale. Reference Point Selector: Click on a node in the icon [ ]. Reference Point Position: Enter the x and y coordinates for the location to preserve. Amount: Specify the ratio of content-aware scaling to normal scaling as a percentage. Protect: Choose an alpha channel as an area to protect. Protect Skin Tones: Protect regions based on skin-tone colors. This image has had the width only scaled to the right, from the center reference point, using both normal scaling (Free Transform) and Content-Aware Scale. Note the detail preserved in the image's original center region. In this image, the width only was scaled using both normal scaling and the Protect Skin Tones [ ] option with content-aware scaling. 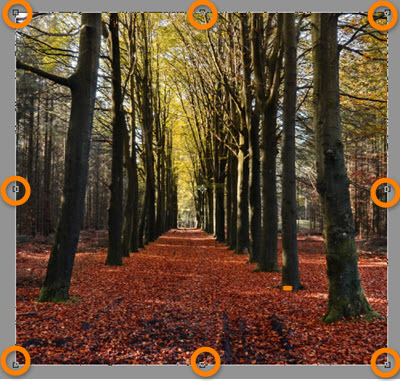 The last example will use Content-Aware Scale with an alpha channel I created selected in the Protect Alpha Channel option.